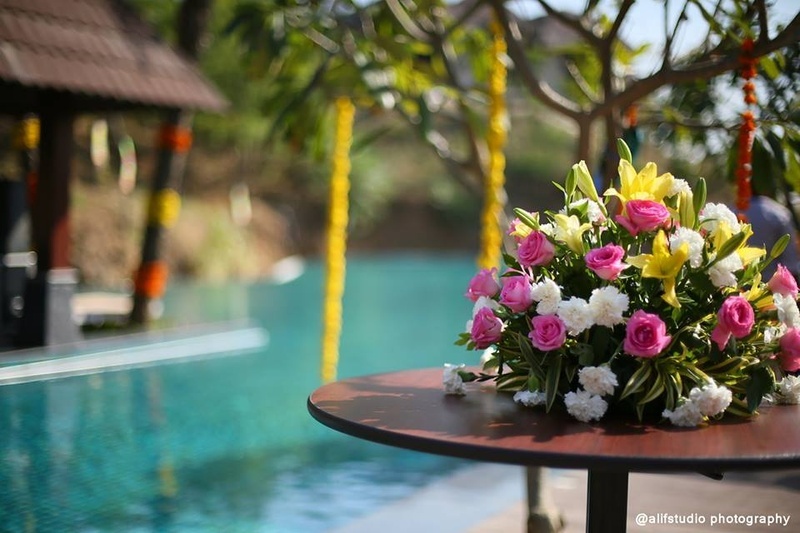 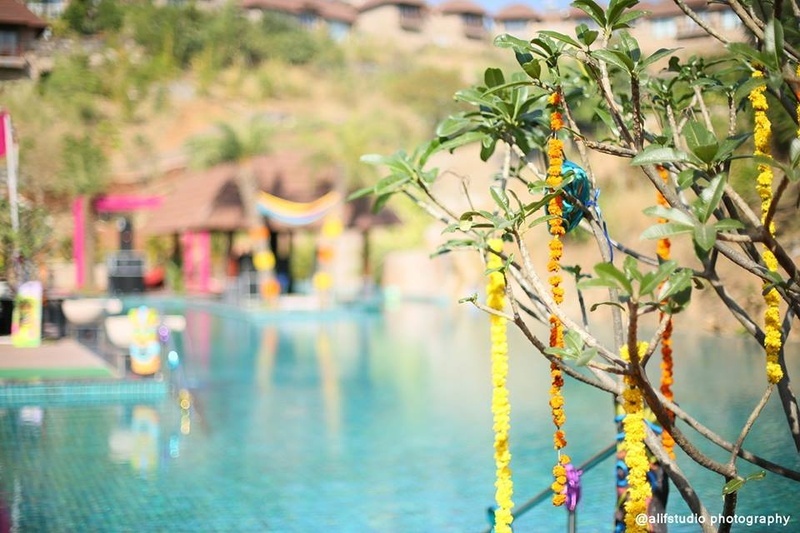 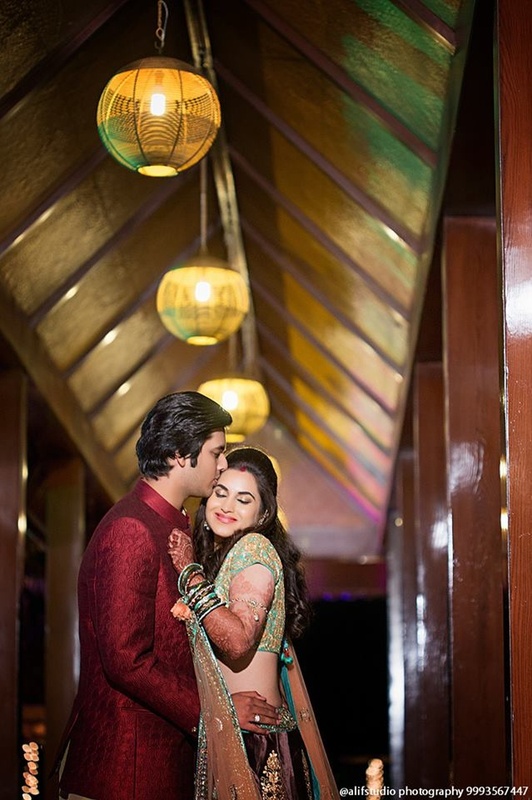 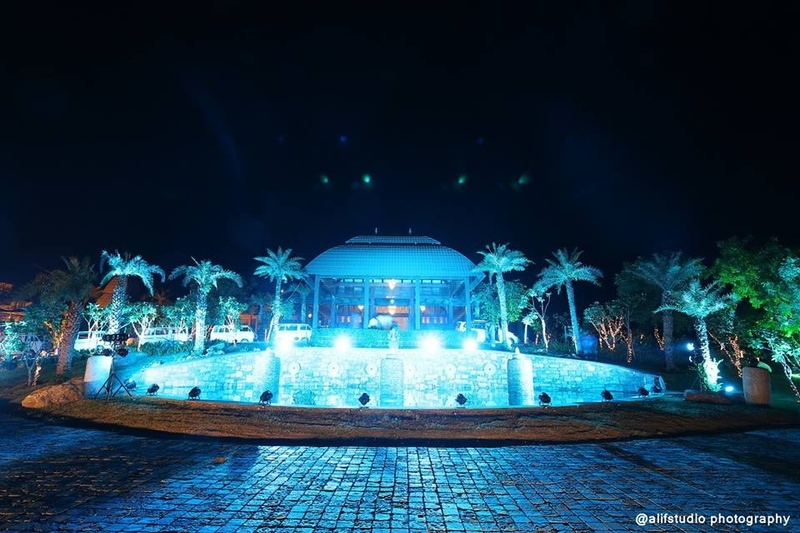 Nestled amidst the sprawling green landscape offering an astounding view of their destination wedding venue, Juhi and Hitesh’s marriage ceremony truly serves as inspiration. 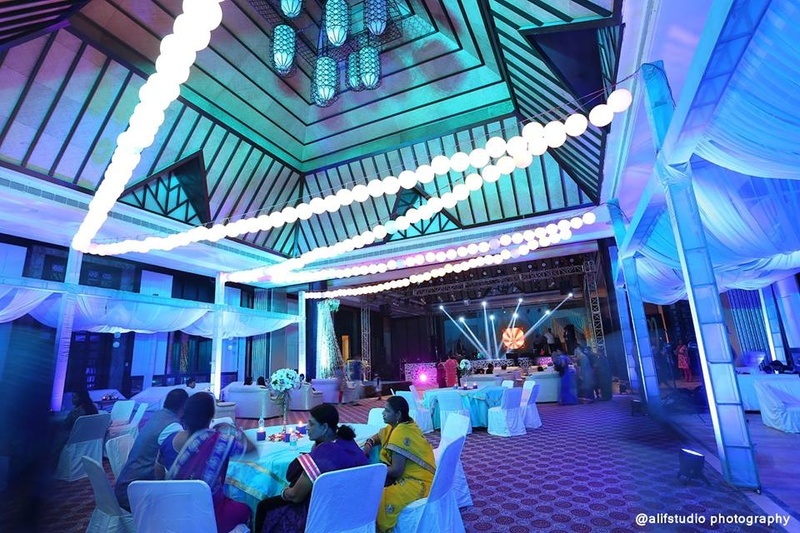 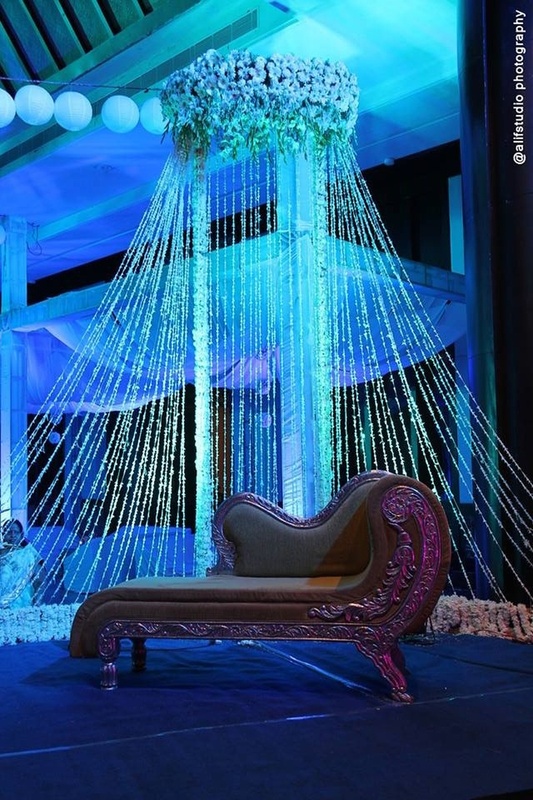 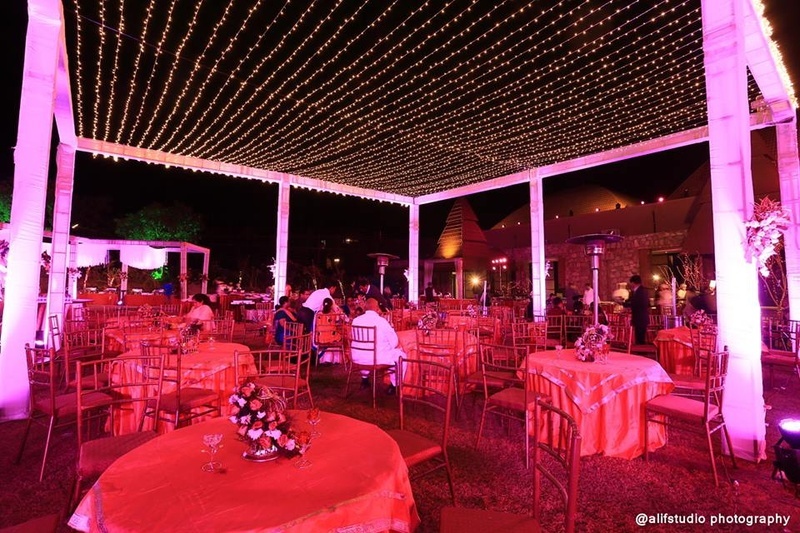 From the break of dawn till the evening dusk, the décor, the lighting and the rituals of this marriage will take you by storm. 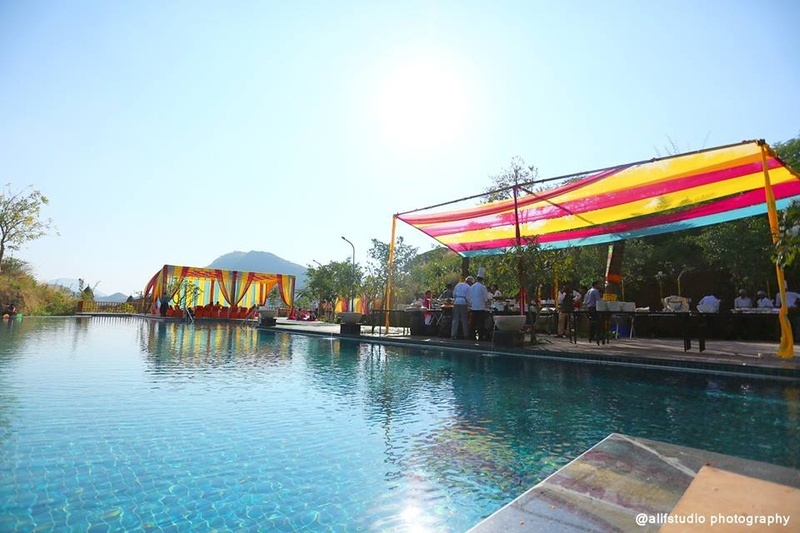 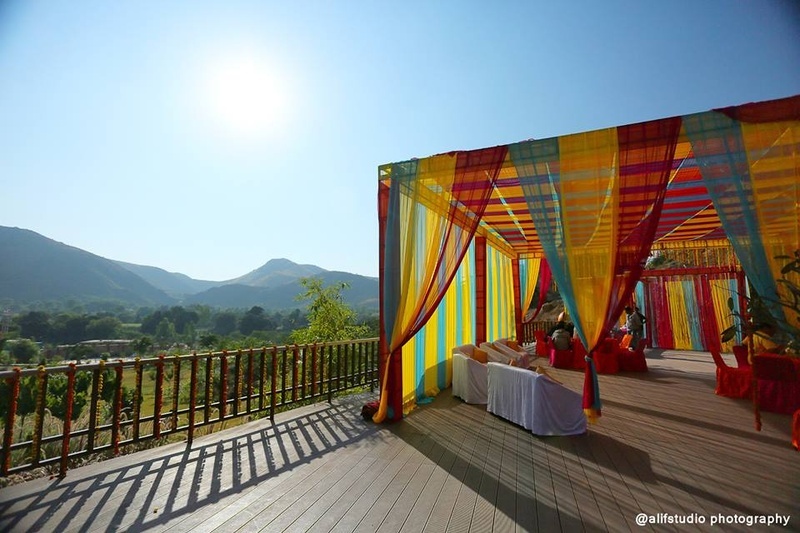 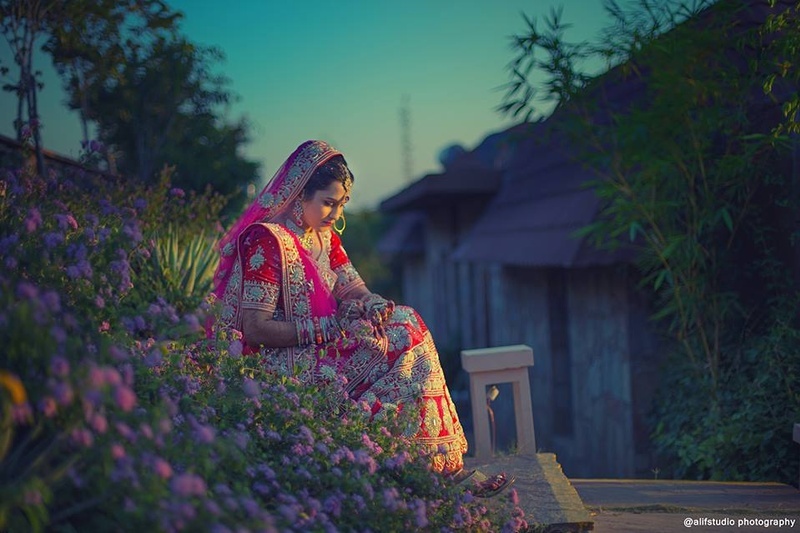 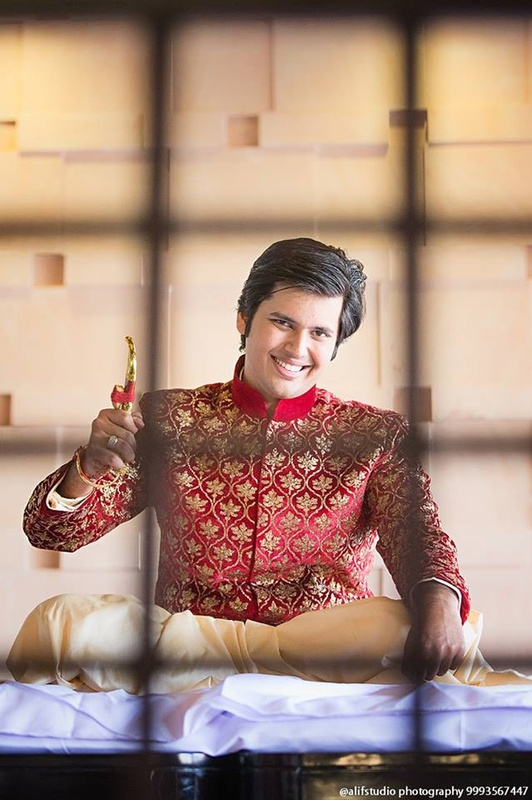 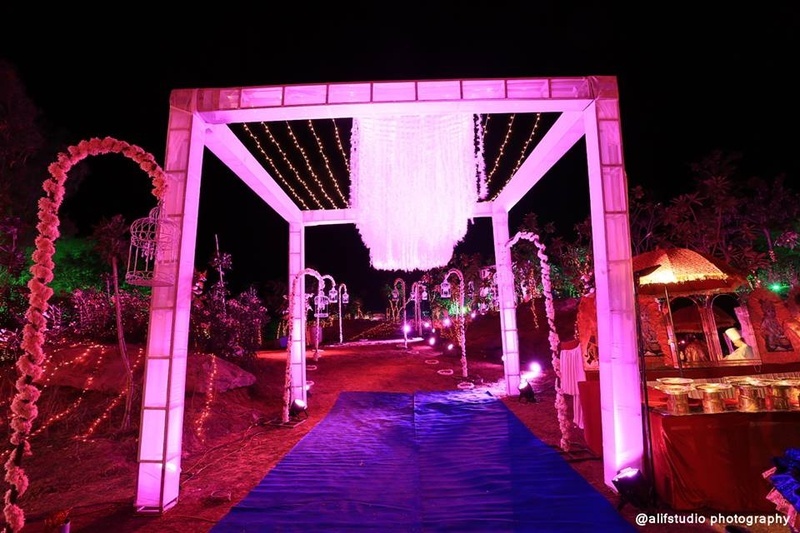 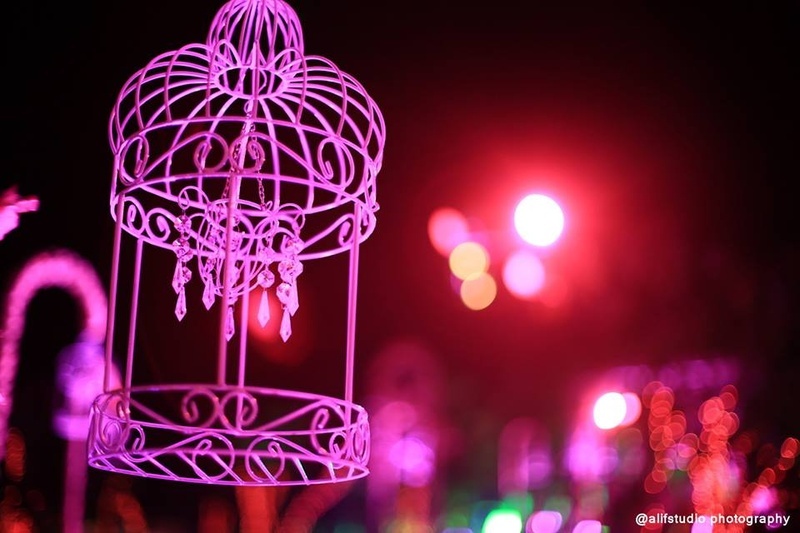 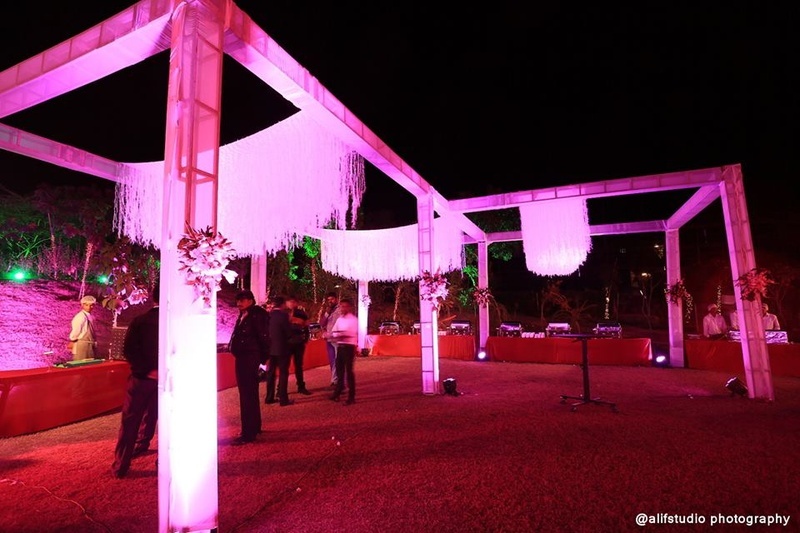 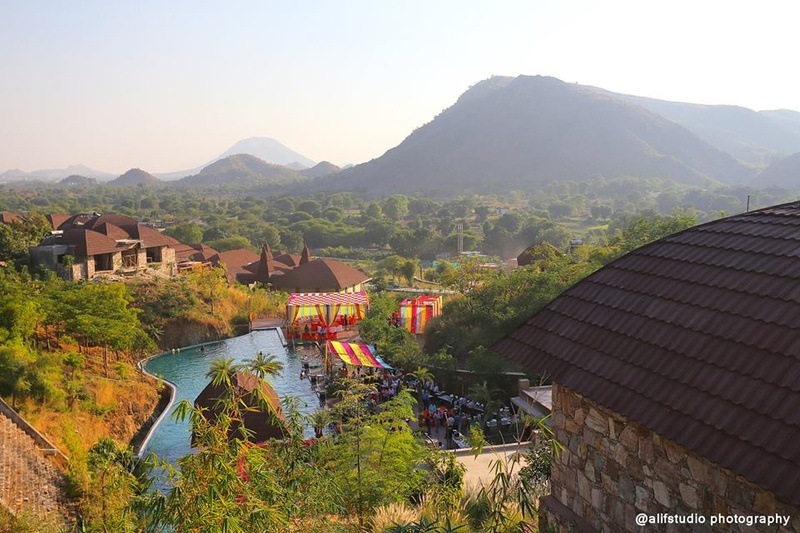 Every inch of this magnificent open-air wedding venue in Udaipur was perfectly utilized. 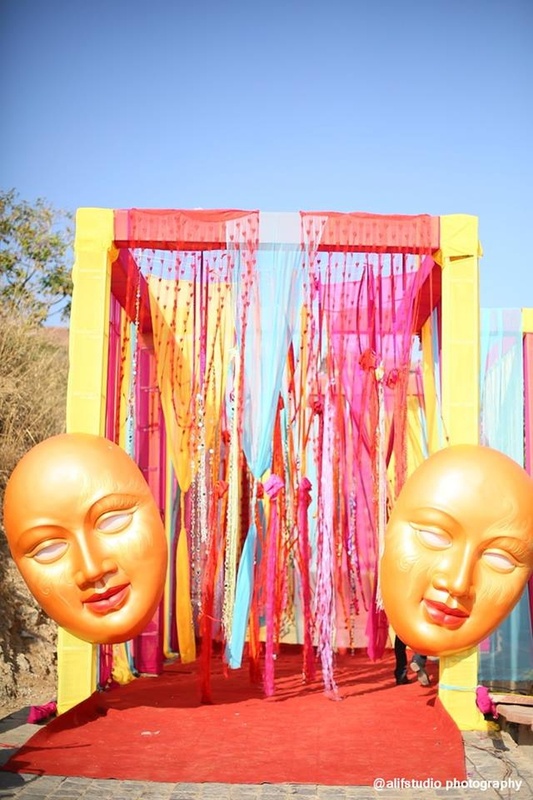 Two gold theatrical masks hung at the entrance dramatically welcomes you to their wedding. 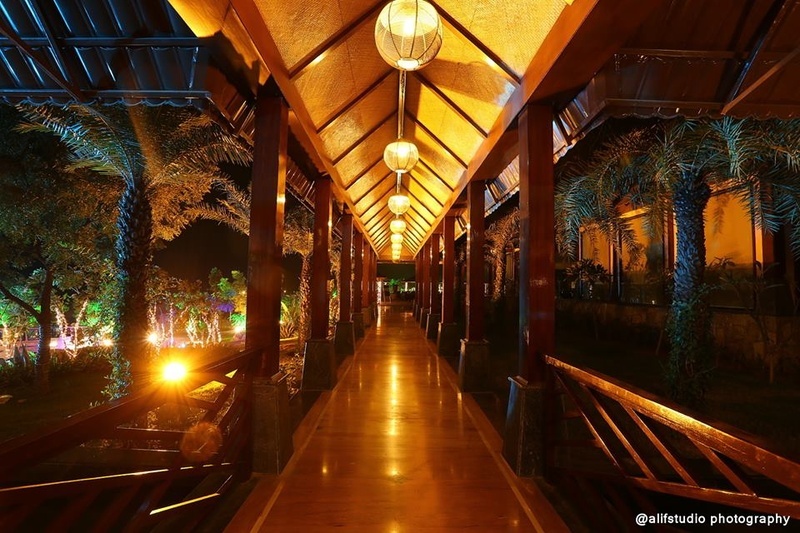 After a short trek on the wooden bridge and taking a few twists and turns, you’ll find yourself standing on a huge patio. 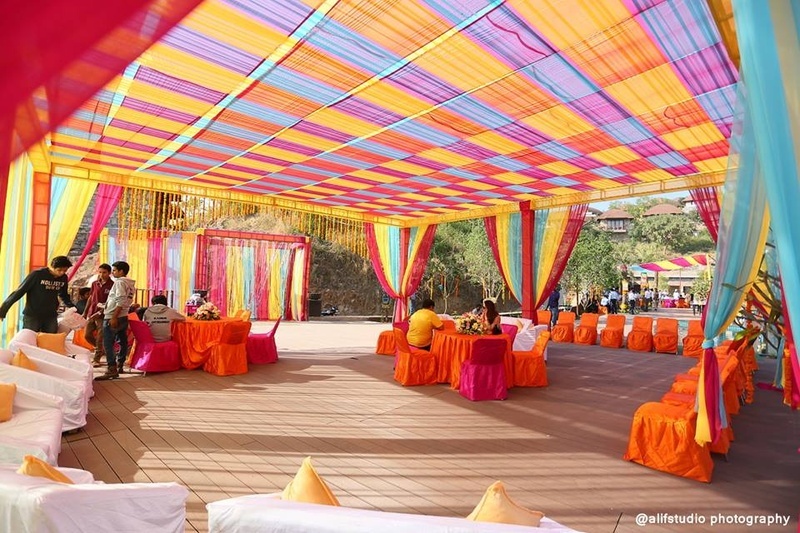 The combination of bright sunshine and the colourful tents was incredibly appealing to the eyes. 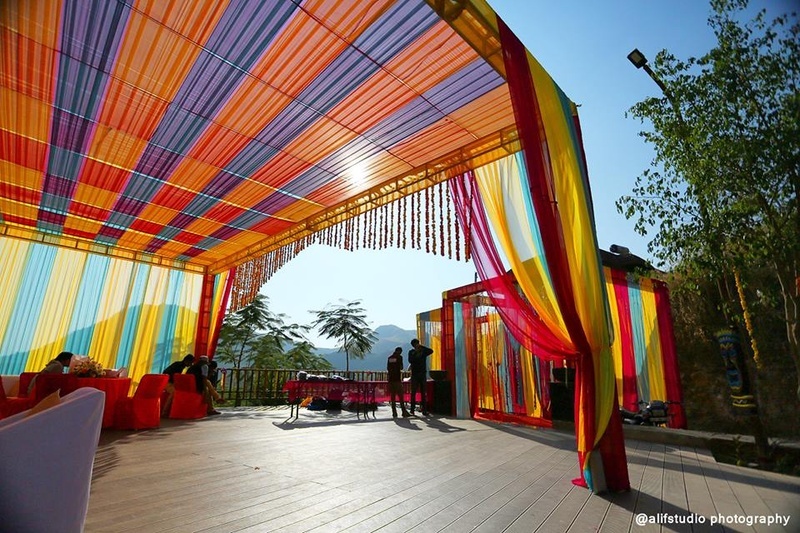 It appeared that the rainbow canopy was specifically erected keeping the rays of sun in mind. 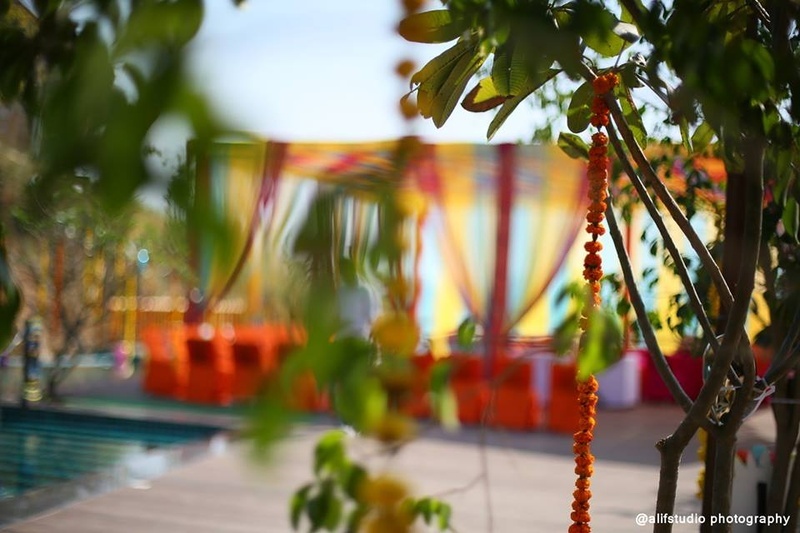 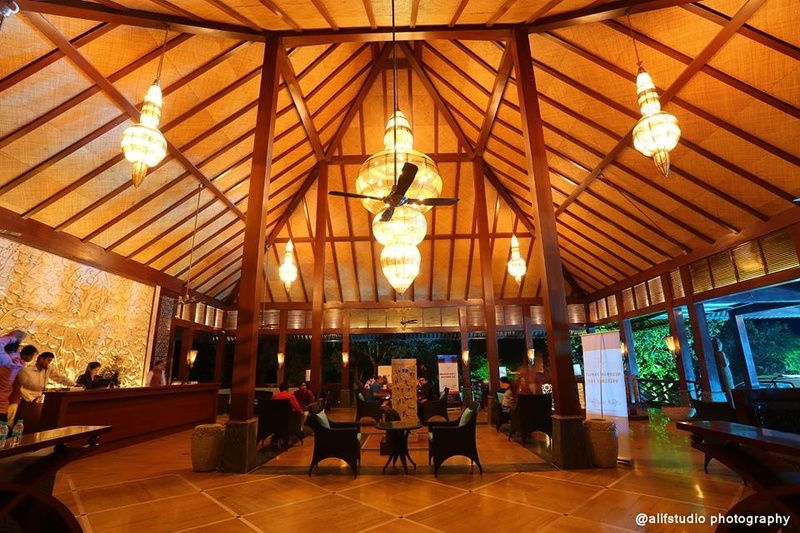 For guests to relish in some delicious food, a poolside buffet spread stood beneath the tent. 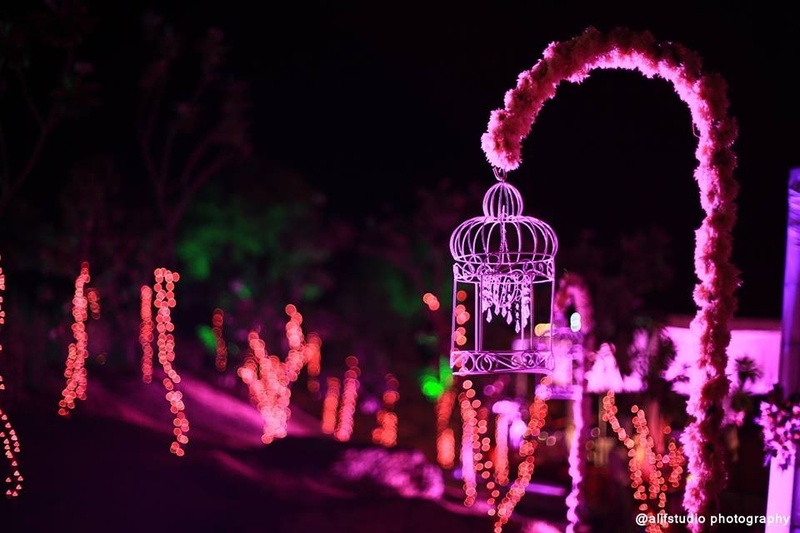 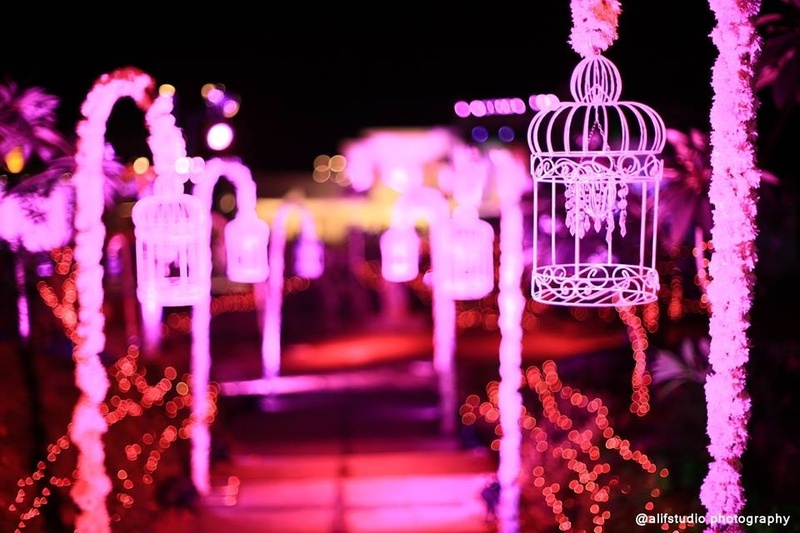 Neon lights created a magical atmosphere in the night. 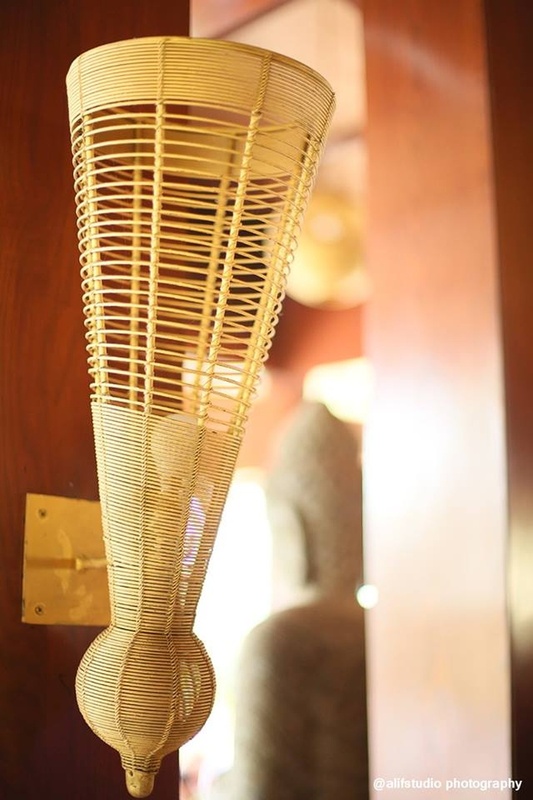 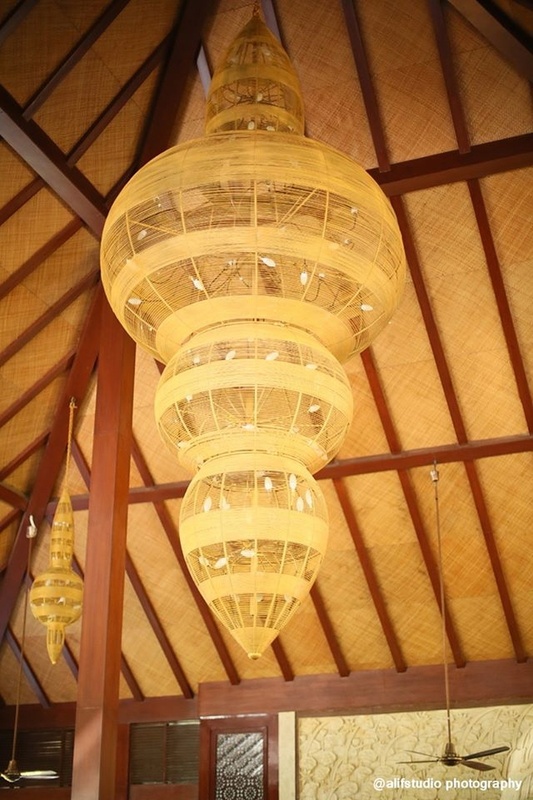 Small cages suspended on each side from a thin wooden stick, was placed at regular intervals. 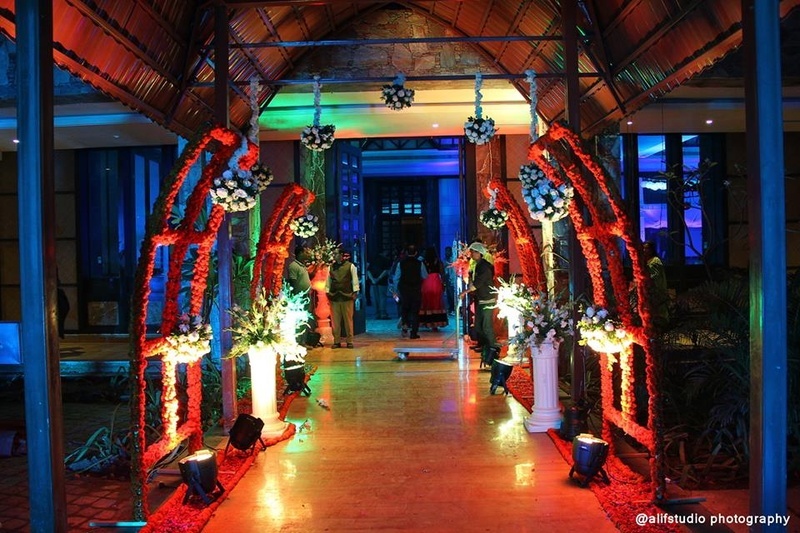 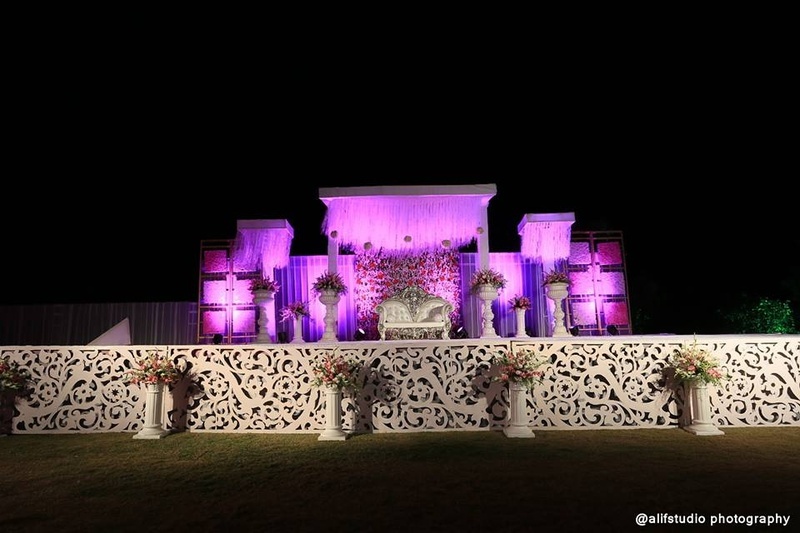 An open air wedding stage with flower bouquets awaited the wedding couple. 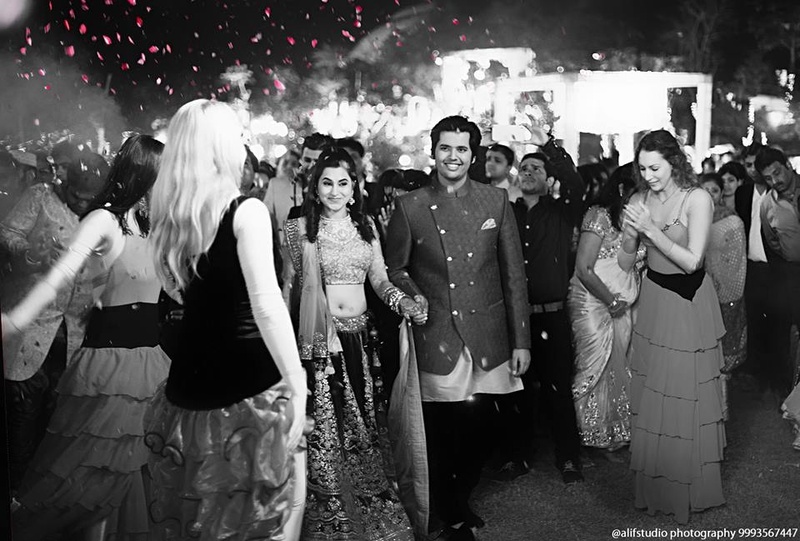 Wearing designer outfits and accompanied by dancers Juhi and Hitesh made a grand entry to the night. 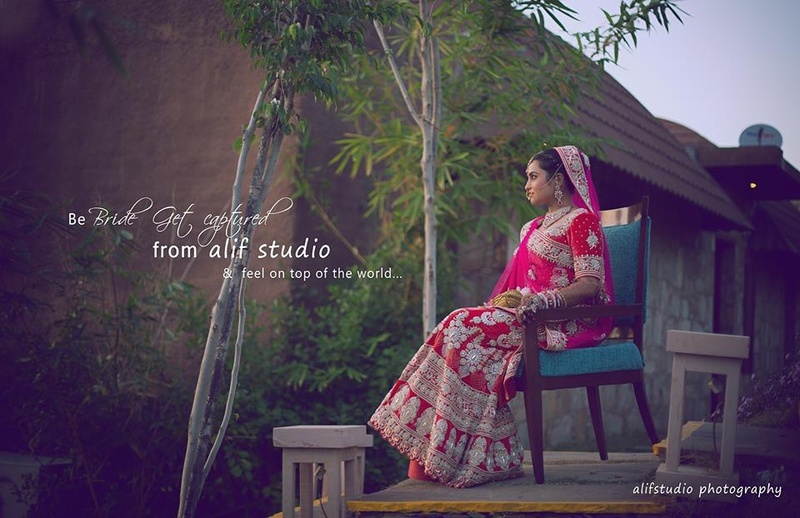 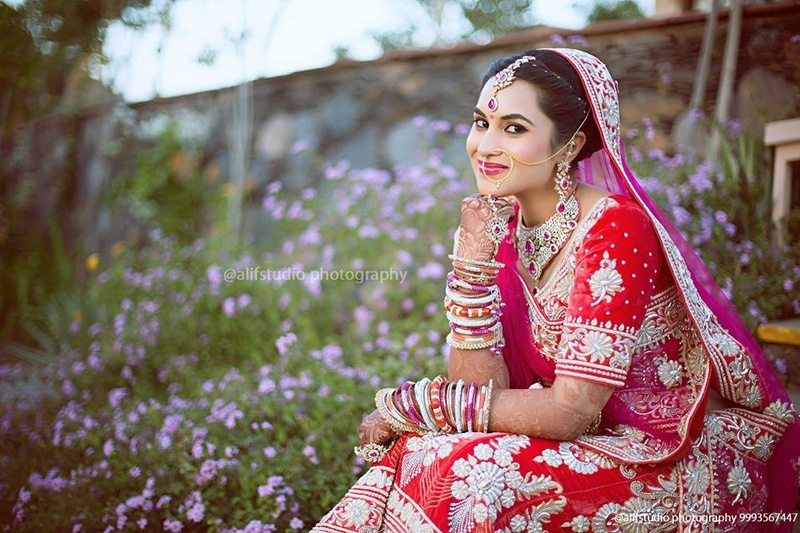 The credit for capturing the true beauty of the this gorgeous wedding goes to Abdul from Alif Studio. 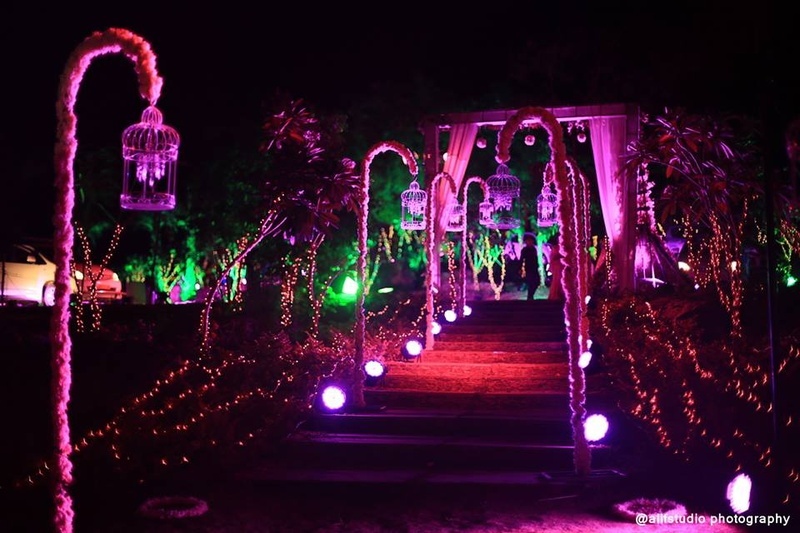 If you are a nature lover and searching for a wedding with amazing decor and lighting ideas, then this album is for you.